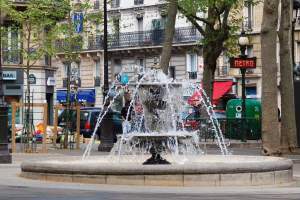 The apartment is near the the Latin Quarter known for its lively atmosphere. 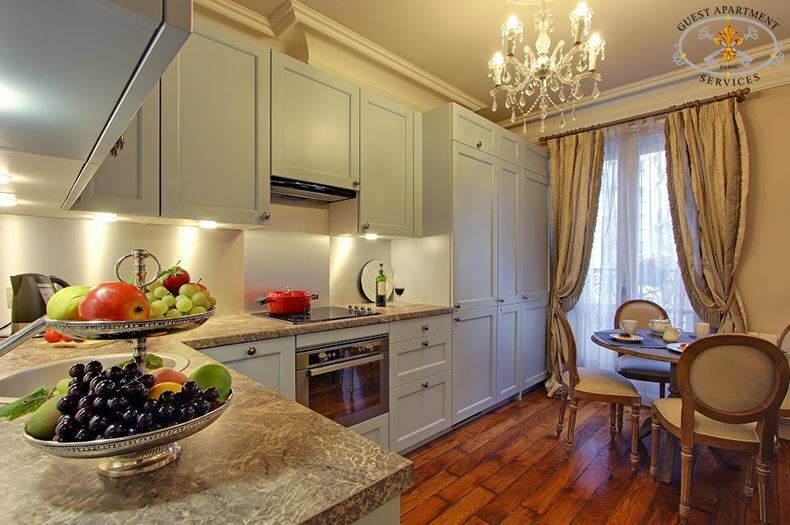 On the Left Bank of the Seine, in the heart of the old Latin Quarter, this Paris luxury apartment for rent is not only close to the Pantheon and the Sorbonne but also to the Boulevard Saint-Germain. 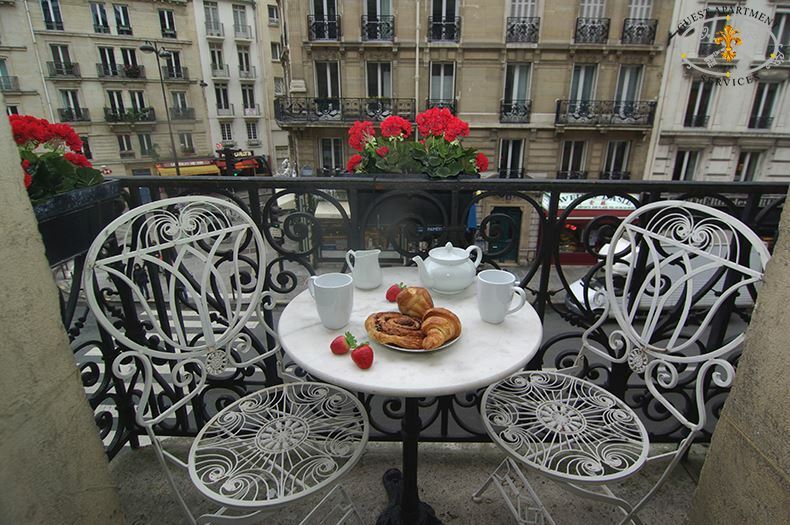 You can enjoy views of a typical Paris neighborhood from the balcony. 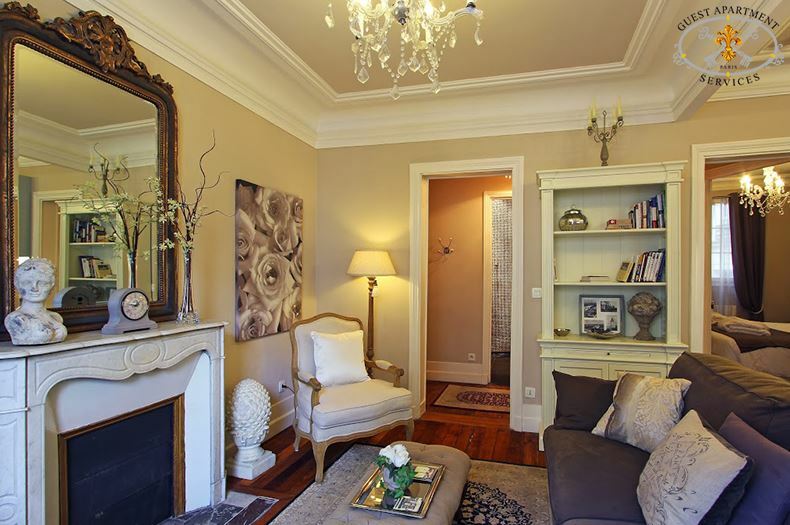 You will certainly be charmed by this warm, bright and stylish one bedroom apartment. 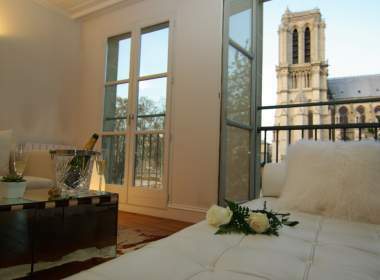 It was completely and carefully renovated to provide you with a luxurious Left Bank experience. 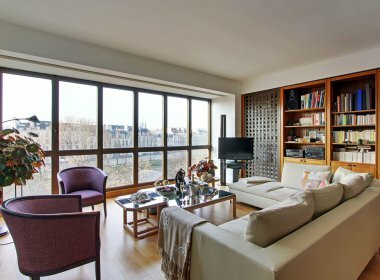 This Paris apartment is ideally located for easy walking distance to many of the Left Bank monuments, as well as Notre-Dame Cathedral, Jardin des Plantes, Cluny Medieval Art Museum as well as many other sites (Arènes de Lutèce, the stunning Paris Mosque, etc…) but also the famous Rue Mouffetard off the Place de la Contrescarpe … Restaurants such as the La Rotisserie du Beaujolais are close by too. 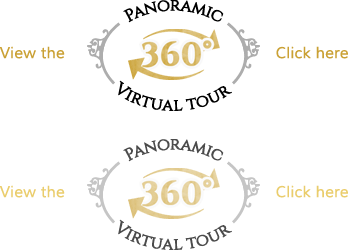 Bakery, grocery, and fine shops are within a short walking distance. 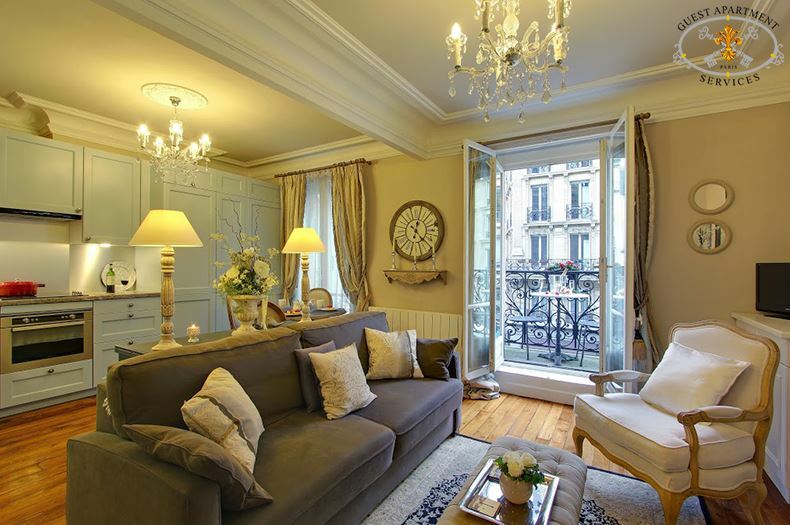 In the heart of the Left Bank with typical street views of the Latin Quarter from your own balcony. 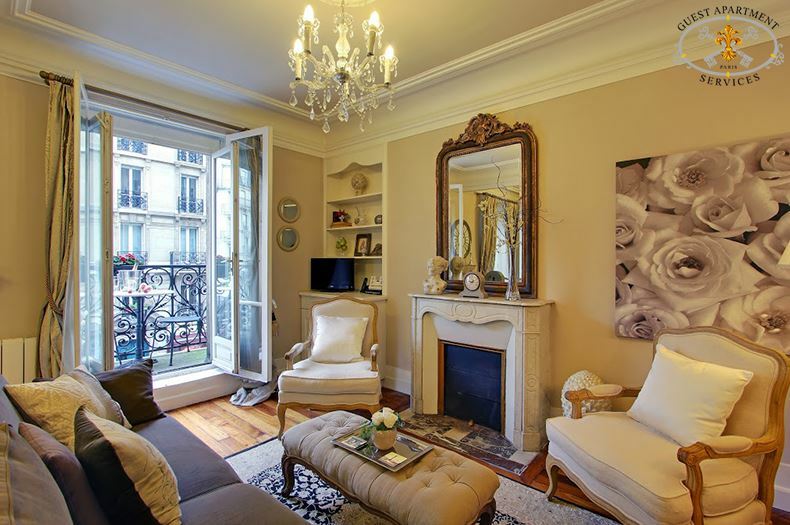 This elegant Haussmann style apartment was completely renovated . 2nd French floor with elevator access. This apartment has electric heaters. New 2013: Equipped with portable Air Conditioning unit present in the living room. Traditional and contemporary materials provide real comfort: oak flooring throughout, marble fireplace, ceramic and glass tiling in kitchen and bath. Floor to ceiling double glazed windows to ensure quietness and plenty of light. 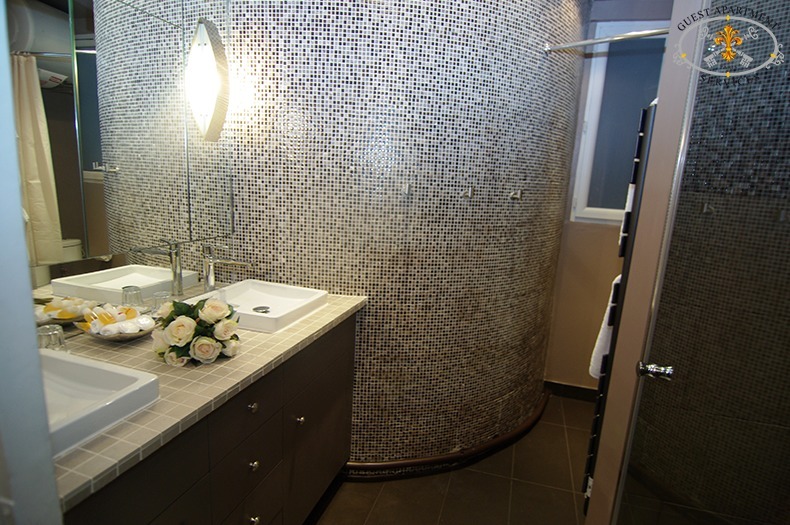 Entirely renovated bathroom. 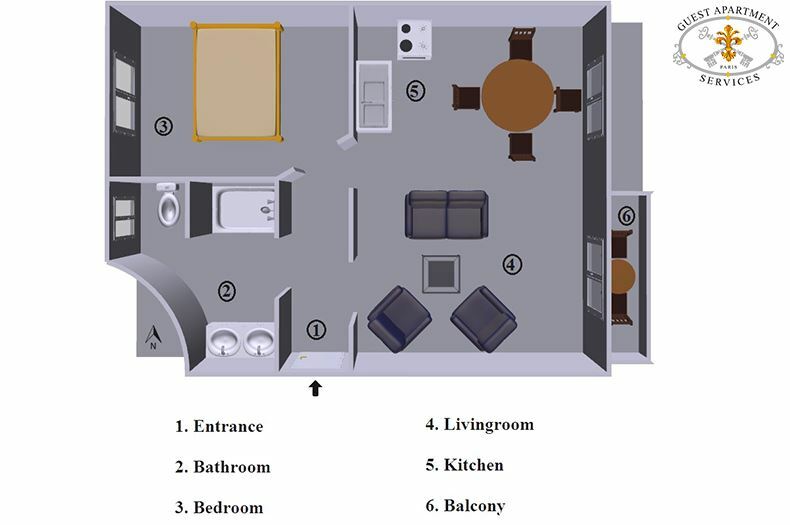 The general lay out is well organized for each room. 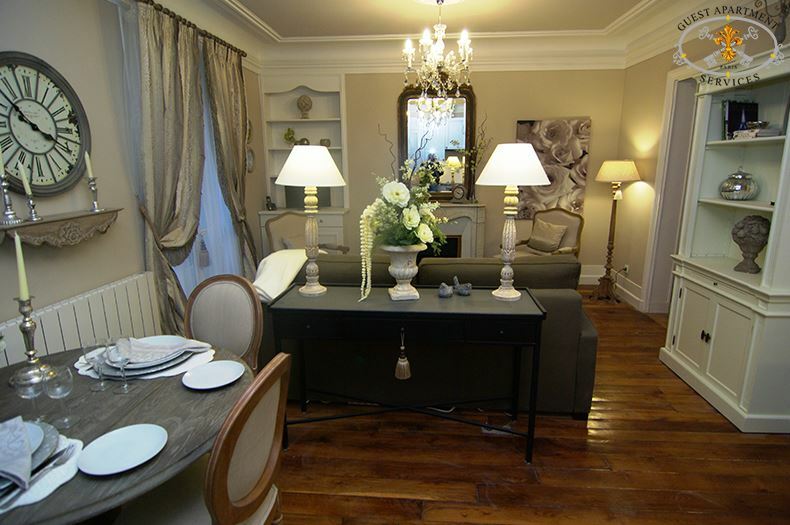 The property is furnished with an elegant mixture of traditional pieces and contemporary decoration. The living room is bathed in day light. Access to the balcony is from the living room. A high quality sofa and an ottoman invite you for relaxing evenings reading, watching the cable equipped flat screen, a dvd on the multi-zone player or better still enjoying champagne with your friends. 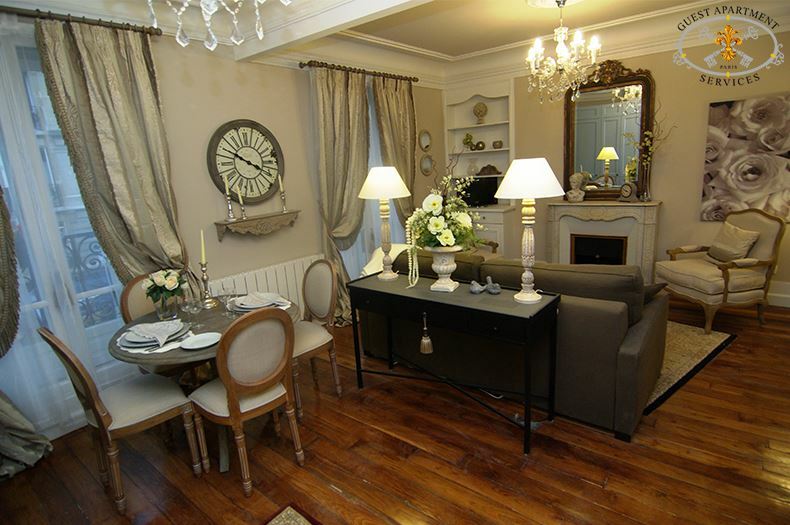 Close by, the dining room area can receive up to four persons for intimate, home-made meals. 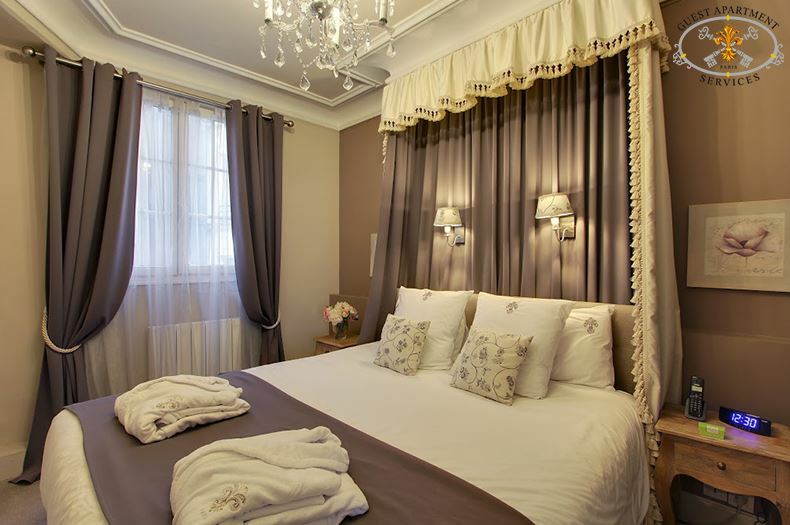 The stately bedroom offers a King sized bed fit for royalty. 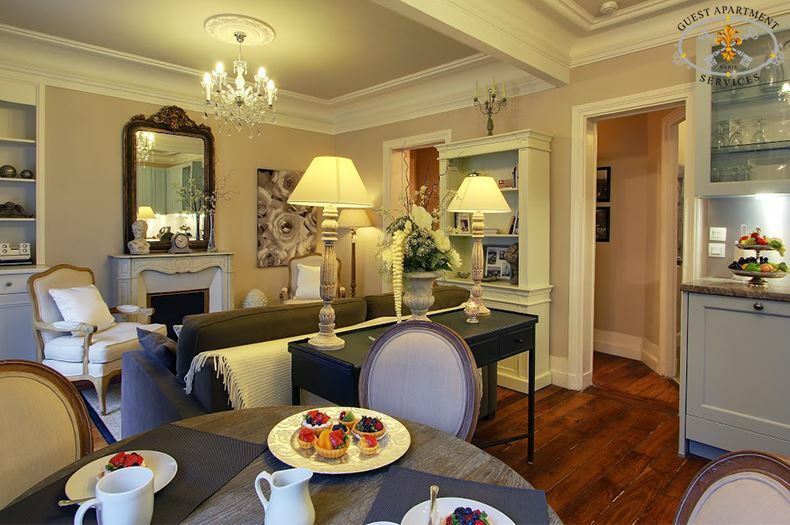 Two wall sconces and a crystal chandelier provide light and ambiance. 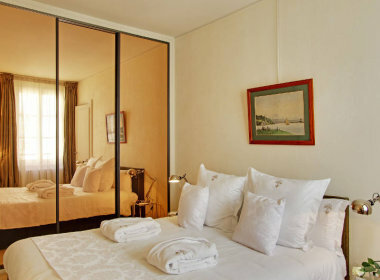 The bedroom overlooks a quiet courtyard…far from the noise of the city. The armoire has plenty of drawers and place to hang your clothing. 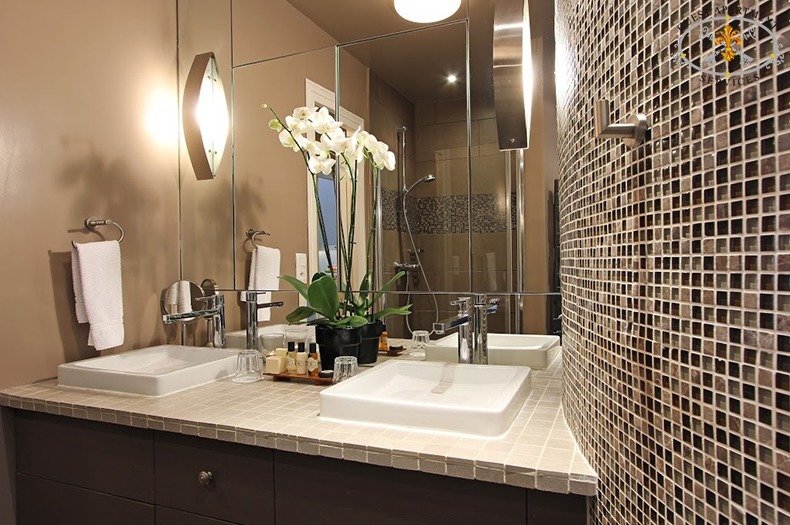 The renovated bathroom is tiled in darker tones, has large lit mirror, a large shower, wash basin, and toiletries. Hair dryer and towel warmer are available. The WC is located here as well. The customized kitchen is large and open to the living area. 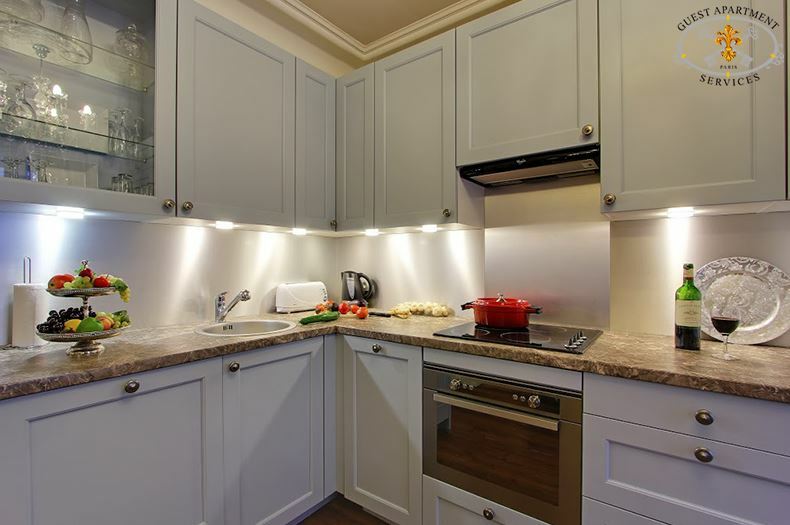 All the main electrical items are present: refrigerator with freezer, oven and ceramic cook top, coffeemaker, electrical kettle, toaster, microwave, dishwasher and separate full sized washer and dryer. Dishes, cutlery, glassware are provided. For a maximum comfort other modern electrical appliances are at your disposal in this weekly rental: A plasma TV with cable offering the main international channels with CNN, BBC …A new multi-zone DVD player, hi-fi stereo with CD player, Private telephone line with answering machine.